Thank you for requesting the newest version of the industry's number one estimating software. The version or versions of Xactimate you may need will depend on which insurance carriers or other assignment senders you support. This form will allow you to see which insurance carrier profiles are on your Key Code and the current Xactimate version they support. Please enter your 20 digit Xactimate Product Key Code below and click Submit. Before upgrading, it is important to backup your data. Once your data is backed up, click on the Download button above and save this file to your computer. Once the download has finished, click to Run the file. After the self-extracting process completes, click the Xactimate icon on your desktop to finish the installation. Xactimate must be registered with XactAnalysis at the time of installation. To register with XactAnalysis, open Xactimate, choose Register from the XactAnalysis menu, and follow the instructions. NOTE: An Internet connection is required to register with XactAnalysis; please be sure your computer is connected to the Internet before installing Xactimate version 27. More detailed installation instructions are available at http://www.xactware.com/27. 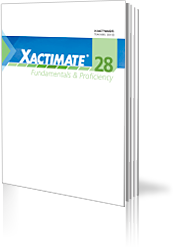 This page also contains the user's guide, Sketch keyboard shortcuts, and more Xactimate 27 information. 24/7 online technical support is available at our eService Center where you can register or login to access a live technician free of charge. You can also contact Xactware phone support Monday through Friday between 6 a.m. and 6 p.m. Mountain Time by calling 800-710-XACT (9228). A $20 fee may be charged for telephone assistance. If you choose this option, please have your credit card ready.